Welcome! Jenkins Arboretum & Gardens is one of eastern Pennsylvania’s great horticultural and environmental assets. As a botanical garden, the Arboretum maintains a collection of trees, shrubs, wildflowers and ferns in a tranquil, naturalistic landscape. 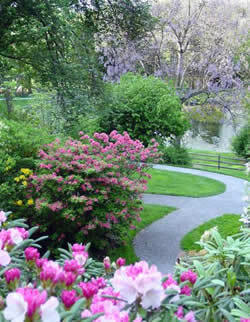 In addition, the Arboretum features a diverse collection of rhododendrons and azaleas from around the world. The unique landscape and diverse plant collections provide sanctuary for a variety of birds, insects and other wildlife. Come explore Jenkins Arboretum & Gardens and enjoy the beauty of every season. The grounds at Jenkins Arboretum & Gardens are open to the public 365 days a year from 8:00 am to sunset. The John J. Willaman Education Center is open every day from 9:00am – 4:00pm except for major holidays.